Mmmmm… Yes, Google can’t answer all my questions. Actually, it can’t answer any of the most important ones. For these I must look within. Rather, no, I must listen within. I don’t mean listen to my mind, nor look into it. I wrote once, with uncanny insight, “Your body knows more about your spiritual well-being than your mind does; Teach your mind to listen to it.” Meditation, Yoga, Tai Chi: these practices are all about getting to know your body while quieting the mind so the mind can listen rather than create all that chatter noise. Even when I was meditating, which was quite a number of years ago, well, I wouldn’t ever have called it “a practice”. 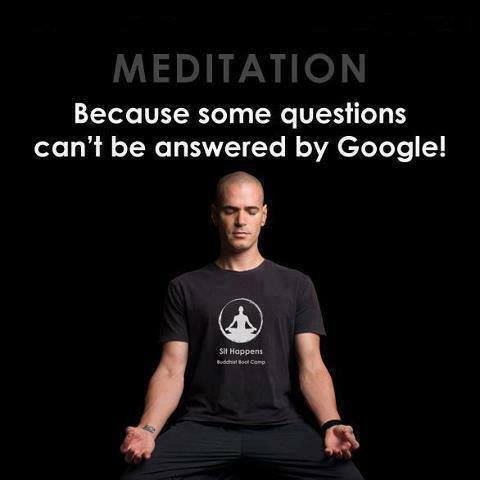 Still, meditation calls to me, along with Tai Chi and, perhaps, yoga, other practices which enlighten us in ways Google can’t. I don’t understand what blocks me from practicing these. But, that does not matter. I do understand the call. It’s my body speaking to my mind. Even science is beginning to see the benefits, though science knows little about the practice, or how meditation ‘works’. I’ve personally glimpsed the benefits ~ and often use a meditative breathing exercise to overcome insomnia, or calm my nerves or anxiety during the day. But that’s not 20 minutes of wakeful meditation. It’s time to answer the call, time to say yes to these practices, beginning with meditation.